I passed by Ben Boyd’s lighthouse on the morning of the 7th of April, on my way back from Green Cape (which we shall see next). 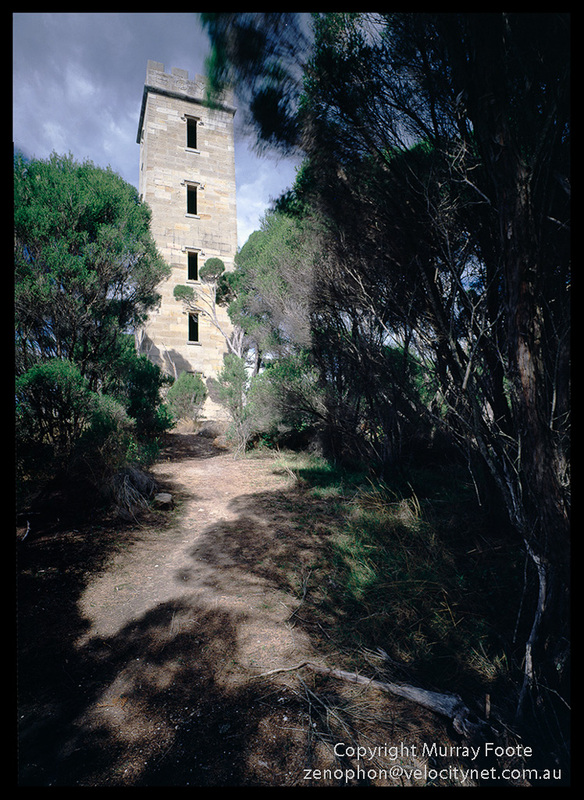 It’s a tall square tower twenty metres high, quite unlike any other Australian lighthouse. If you click on it to enlarge it, you should be able to see the name “BOYD” engraved at the top. It was built by Ben Boyd during the 1840s and either never lit or only lit a few times. Its use was never approved by the New South Wales Government. Originally there were wooden floors and stairs inside the lighthouse but these were gone by 1987 and I would think it most unlikely that they were subsequently replaced. Ben Boyd was a Scottish entrepreneur (originally based in London) and a founder of the Royal Bank of Australia in the late 1830s. He came to Australia with £200,000 of debentures and proceeded to purchase extensive agricultural land, set up a steamship service between Melbourne and Sydney, and build a port (Boydtown) at Twofold Bay in Southern NSW to transport his farming produce. The lighthouse was built on the southern point of Twofold Bay for the benefit of his nacscent township. Ben Boyd came to financial grief through labour shortages, unwillingness to pay “fair” wages, attempted exploitation of Pacific labour, a failed insurance claim for a ship and general overambition. The bank failed in 1847 and Boyd headed off to California to try his hand at the gold rush. He also failed at that and headed back off across the Pacific to New Guinea to try another scheme but appears to have been killed in the Solomon Islands en route. This entry was posted in Australia, From Dusk Till Dawn and tagged Architecture, Australia, Ben Boyd, Ben Boyd's Lighthouse, Boyd's Tower, History, Landscape, Lighthouses, New South Wales, Photography, seascape, Travel. Saros. Steamship, steel, 2044 tons. Built 1910. Lbd 350.1 x 46.5 x 22.4 ft. Captain Aitken. LeftGeelong for Sydney on 23 december 1937; ashore in heavy fog, at Point Hicks (Cape Everard), Gippsland coast, directly in front of the memorial commemorating James Cook’s first sighting of the Australian mainland, December 1937. A distress signal brought the Orungal, Canberra, Burwah and other ships to the scene. All crew rescued. Wreckage from the Saros lies on the rocks near the lighthouse, and submerged a short distance offshore. At some stage called Balti Sten. [LG],[LH – 3304 tons],[LV],[LC – 3304 tons] Previous incident: In 1923, involved in rescue – see SS Iron Prince. Useful additional information. Thanks for that.